A few weeks ago I was very blessed to have the opportunity to spend a whirlwind 3 days in Fiji. The purpose? Well isn’t it obvious? Work in a high of 10 degrees in New Zealand, or the warm sunny skies of 25 degrees in Fiji 🙂 Too easy! 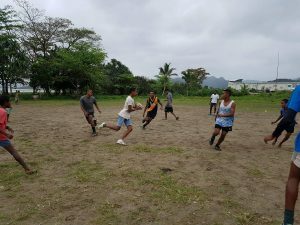 But the main aim is to use the resources we have, and give back to the poorer Fijian communities all around the islands to help promote the game, but most importantly help the kids and coaches in these communities that may not have much else in life but the joy of throwing the oval shaped ball around with friends and family. 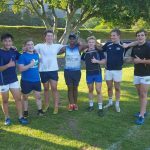 New Zealand and Australia have been very blessed to have Fijian players from the islands over to play for sports teams, clubs at a college level, club level and of course at the high performance level. There is so much talent in Fiji (and across all of the islands) that for whatever reason don’t get attention or a look in. Luckily Toki Services is in a position where we can connect in a small way, we hope someday we can keep growing across the islands. Watch this space! One thing I noticed in Fiji is mostly everyone seems to be so kind and inviting. The people are happy to have you in their region and want to make you feel so welcome. Surrounded by gentle giants all over the island, whether you’re at your hotel, walking the streets of Suva or Nadi, the people of Fiji are one of the most genuinely happy people you’ll ever meet. I happened to drive past the legendary Marika Vunibakas old club in Suva and there were a group of boys (pictured below and featured pic) throwing the pill around in the pouring rain, laughing, joking and just having a great time diving around in the puddles, kicking goals, stepping one another and giving on another a bit of stick. It made me think this is what rugby is all about, the grassroots, the mudball in the rain, the times where you don’t care about systems, patterns of play, defensive or attack structures, you just get out there and enjoy being around your mates. 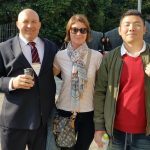 I think it’s something we may have overlooked which is the pure enjoyment of social rugby – or getting out there and throwing the ball around. 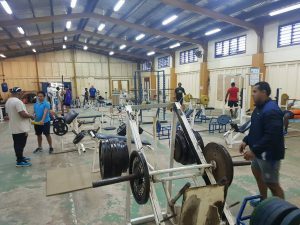 I also had the chance to pop into the Fijian High Performance unit in Suva, what a great venue and I even bumped into the new Fijian Drua side who are the newly formed team in the Australian NRC team – massive units those boys. 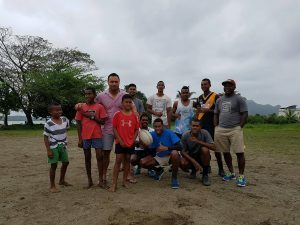 The final stop before leaving Suva for Denarau was to visit the village of Suvavou, this village like many others have 1 rugby ball, a paddock, and a makeshift rugby post in the entire village. They use the the same ball for training, their games and when they play around in the paddock in their free time like when I saw them. It was great to see their natural skills and flair, they evaded one another on attack with ease, and they could find the space with ease. Seeing them also brought me back down to earth, damn I’m lucky and blessed to be able to have access to balls, cones, hit shields, boots, jerseys, a proper field! Whereas these kids don’t have the same luxuries, I take a lot for granted in my life and want to make a conscious effort not to, the same lessons I want to pass onto my son too. He’s a very blessed boy and he should always look to help others when he can in life. One thing I want to make note of – these kids were happy. 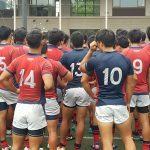 They love getting out there and playing rugby. None of the kids were dwelling on their living situations, they found happiness with the oval shaped ball instead. Below is the Nadi Police team training – passing drills. 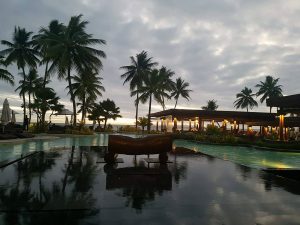 Vinaka Fiji, I am very thankful for my brief visit and I cannot wait to come back and hopefully share with you all.